Slim you have done an awesome study of statistic on cartridge. I am really grateful that you are sharing these with us. These data are wonderful to further the study to create a perfect load. What I can think of the collation of these is the fact that cartridges with the same brand that come in the same package could show different expansion values due to the variation of material properties. In my uneducated opinion, I would tend to dismiss these differences due to the fact that although we are quantitatively measured the charges of the cartridges, we have no influence to the burning ability of the powder for that moment in the charge. The burning rate may change minusculely due to variation of temperature, humidity, amount of graphite lubrication/burn retardant of the powder and the actual lay of the powder charge in the cartridge at the moment of ignition. These variations would present a large quantity of variables that may cause the differences in the head expansion. gelandangan makes some very good points !!! He eludes to why it's important to take multiple measurements and work with the averages. The reason for this is we are dealing with subjective information as opposed to objective information. Slim.....was thinking about this today !!! If you have a good load that you've been using why not use that as your control. After measuring and firing just re-load those cases for your new load development. If you don't have a load already develop one using some new brass in conjunction with the common powders, load lengths and data. I wouldn't worry about it's performance per-say, because this will only be used to establish your control. I think this might be an area of confusion !!! I believe there are 4 places that can measure case expansion. Each measuring point also has it's own set of guidelines. There are also those that would argue the validity of which to use for pressure testing. The head of the case, the extractor groove, the edge just aft the extractor groove and the web of the case. Slim, I'm not positive but I think the edge is the one that references the .0005 measurement. chambered, I didn't state it, but that is what I did. 27.3gr of AA2200 in Hornady brass with a 2.295" COAL was one of my good loads that happened to match manufacture's max load data. Thanks for the great informative and interesting subjects you cover. This one ranks with the best. It is one of the key issues facing the reloader. While everyone says "Work up your loads and look for pressure signs", actual factual information on how all the popular signs relate to pressure is hard to find. For every proponent of each sign there are one or more who argue the validity, reliability or both of that indicator. After reading it all, it is great to see a report with facts not just options. Thanks, MacD. I finished loading all my rounds for the next range session. I've got a control group to make sure last range results are repeated then I start experimenting with seating depth, different bullets and powders, to see if I can use case head expansion as a guide to ensure I'm not getting my loads too hot. I need to do this because I'm reloading with longer COALs and non-standard powders that are not covered by any published load data. I should be exciting. I sure hope there is some good correlation. Sorry, but I have to say this. Am I the only one that misses the point where you measure the hardness of your brass? You can do many things, but I would suggest to start with 2 rounds that are exactly the same, with 1 difference: 1 case was annealed and the other not. My point of view: external balistics is a very difficult science, but once you start to think about internal stuff... I always considered myself rather clever and being engineer I sure like to measure, but my stomach teaches me not to try to measure too much. Enough "why-questions" make any intelligent being sweat at some point. Living is easy when you pull the trigger, you hear 'boom' and you see your game go down. And when missed, it simply might not have been its time yet. But I have to admit I already learned lots of things with SJ's experiments, thanks for that! Aloys, the difference in work hardening can be seen in the table as there are new, once-fired, and multi-fired cases. I have picked out several of the new cases and will record their case head expansion over time. When brass is annealed, its only the neck and shoulder that is supposed to be heated and cooled. It’s time to stop analyzing data and building charts. It’s time to just present the data. Sorry, I’ve been away from this topic for 4 months but I didn’t have any information of added value to post. The lapse has been partly due to work schedule and, when I did get to the range, trying to figure a more reliable means of determining a load that was too hot. Recapping, I have been loading longer than mag length COALs in my 6.8mm SPC II and using new powders which caused my rifle to be way over-gassed in an 18-inch ARP barrel. Different weight buffers did nothing to alleviate the problem but an adjustable gas block was just the ticket. However, swipes have become rare and appear to late for indicating high pressure plus primers have not been a good clue in my 6.8mm. Thus, I started investigating a technique measuring the base of the brass case to see if it could be reliably used to determine high chamber pressures. 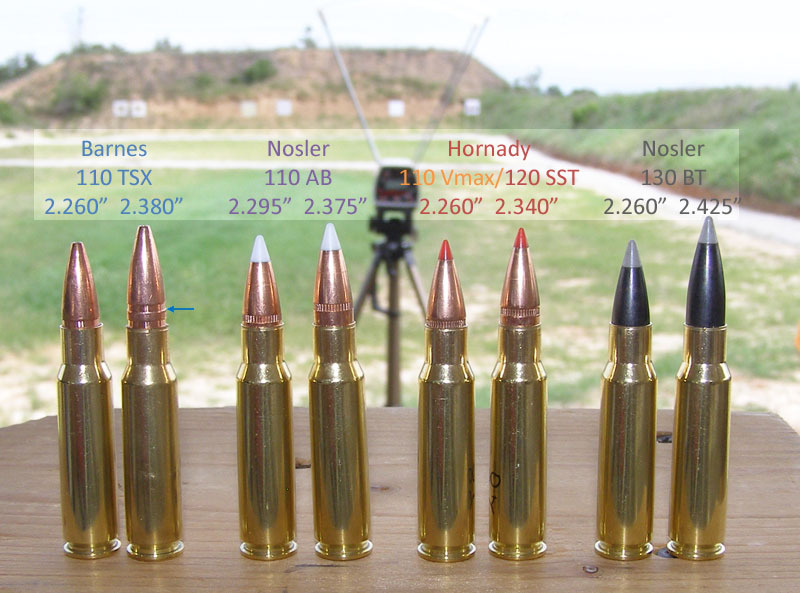 As a relative comparison, prior testing posted in this thread showed new SSA brass expands the most, around 0.0040” on a typical near max load. 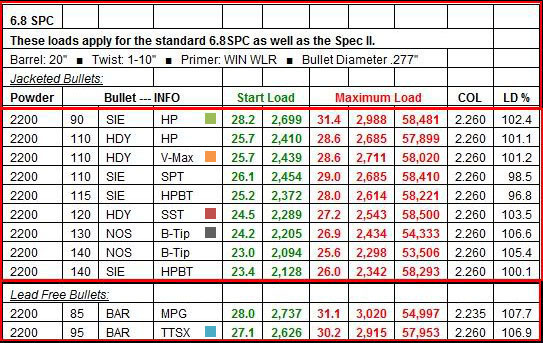 New Hornady is next (0.0035”) and Federal the least (0.0025”). Remington brass was not available to test. Note, these measurements are with a micrometer to 1/10,000th of an inch. The plan of attack is to establish a Case Head Expansion (CHExp) measurement that can be used to reliably develop 6.8mm loads that have longer than magazine length COALs and take advantage of slower burning powders with the increased in case capacity. 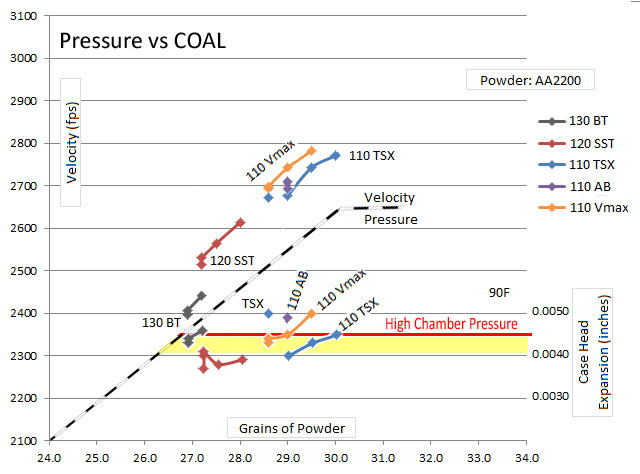 With this knowledge, longer COAL load development can progressive for 110gr, 120gr, and then 130gr bullets. The initial steps to determine relative chamber pressure are complete. Following shortly will be some load information with various powders for 110gr Barnes TSX and 110gr Nosler AccuBond (AB). Examples of bullets loaded with longer COALs are shown below. The 130gr bullets really show the difference. Several range sessions were conducted in varying temperatures. It has taken a while for all the pieces to come together and make a conclusion. The test information will be released in stages as listed below. Selected bullets were loaded to maximum load recommendations using standard and longer COALs measured to work in my rifle. I have shot these bullets and powder combination before so was comfortable starting out at the manufacturer’s recommended max charge weight. Don’t do this if you haven’t shot these bullet-powder combinations before. 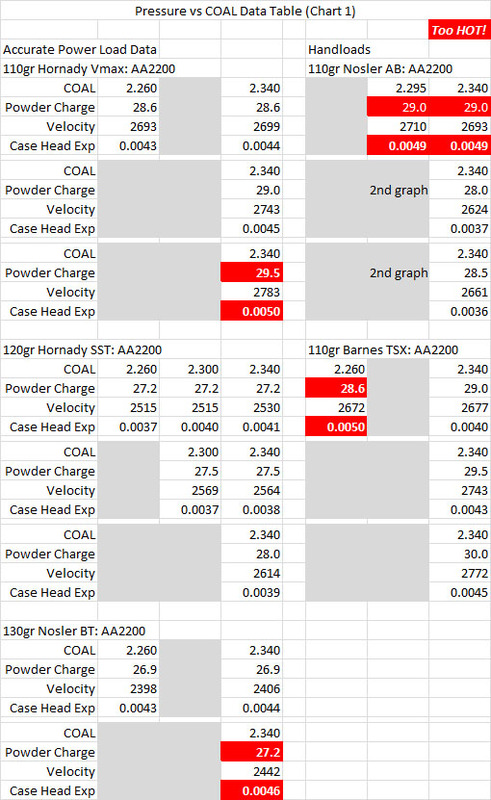 I did plan for some loads above maximum charge weight assuming that the longer COALs would result in reduced pressure (surprise #1). I also included some handloads I had used for 110 AB and 110 TSX. The AB load has been used for terminal performance testing and was one I picked from reading other shooters’ posts. The 110 TSX was a load I had developed for 2.295” COAL but shortened to 2.260” for the test. Both these turned out to be not the best thing to do (surprise #2). 18-inch ARP Barrel, 1:11.25 twist. Temperature at the range was 90F. Here are the initial results in graphical and tabular form.